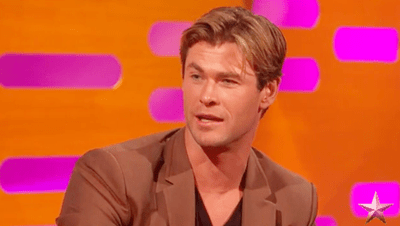 The dreamy Chris Hemsworth appeared on The Graham Norton Show sans hammer last night with Lily Tomlin, Ron Howard and Scottish stand-up comic Kevin Bridges (who Tomlin had a devil of a time understanding). Chris told a story about going to prison to do some research for the film Blackhat, in which he plays a furloughed convict. He figured nobody would recognize him but it turned out that they’re just as hot for Thor as we are. Nothing like a Thor prison fantasy to start the day off right.